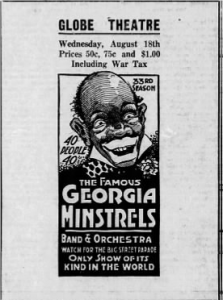 The photo to the left is an advertisement which seems to depict an over-exaggerated drawing of an African American man or perhaps a white individual in blackface. The group advertised were a well-known African American blackface blackface minstrel troupe who typically performed comic skits, variety acts, as well as dancing and musical performances that mocked African American community. 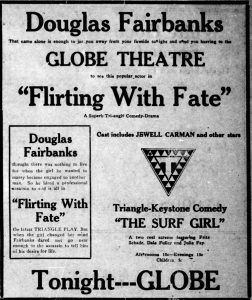 Flirting With Fate, a 1916 film starring Douglas Fairbanks, details a man’s attempt to end his life. Following the news that the woman he loves has become engaged to another man, Faribanks’ character becomes distraught. Believing there is no longer a reason to live, he seeks a professional to end his life though a shift in thinking occurs as the woman changes her mind, deciding against marriage. In an attempt to survive, the man must avoid the hit he has thrust upon himself. 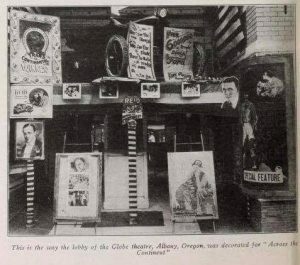 The image to the right is an advertisement for a showing at the Globe Theatre, located in Albany. The advertisement itself highlights the growing popularity of moving pictures, a time in which actors became recognized for their work. The ability to use ones celebrity status to promote a film is evident as Douglas Fairbanks’ name is seen in bold lettering, above the film’s title and theatre itself. Below is the film in its entirety, with a run time of 57 minutes. Provided by the Motion Picture News, the photo to the left highlights a promotional technique utilized by the Globe Theatre. The theatre’s lobby was decorated in order to inform viewers of a film titled Across the Coninent. An attractive display, its purpose was to attract local bypassers. In an effort to support the Albany Red Cross Association, the Globe Theatre collaborated with the organization and showed a film titled A Modern Mother Goose. The Red Cross was responsible for the film while the theatre’s manager made concessions in order to provide the organization with a greater share of the profits for tickets sold. In order to attract a broader audience, tickets were sold at local drug stores and other various retailers throughout the city. There was also a solicitation for tickets, with tickets being sold for 25 cents, 15 cents for children. Beyond the film, several specialty acts were provided by local entertainment in order create a successful and diverse night of entertainment. 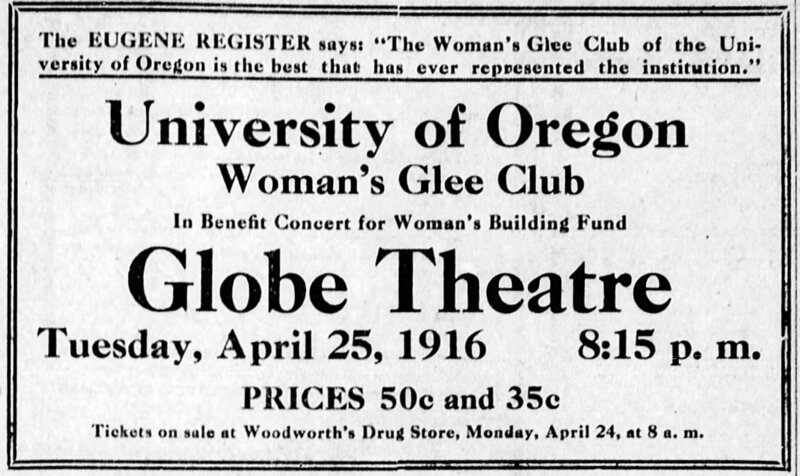 A collaborative effort between the Globe Theatre and the University of Oregon Woman’s Glee Club is shown in an advertisement for a concert, benefiting the woman’s building fund. Tickets were sold at Woodworth’s Drug Store a day prior to the fundraser. 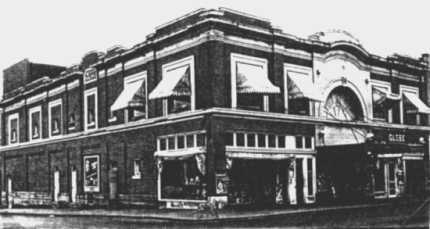 (1929)- Barney Kenworthy of the V.B Kenworthy Theaters Company announces a major refurbishment of the Globe Theatre to accommodate the new RCA photophone, “soft carpets.. luxurious chairs….” and other improvements to the theatre. Globe Theatre, advertisement, Albany Daily Democrat, August 14, 1920: 5. Globe Theatre, advertisement, Albany Daily Democrat, 12, 1917: 3. “Red Cross Will Give Benefit Production,” Albany Daily Democrat, April 24, 1917: 1. 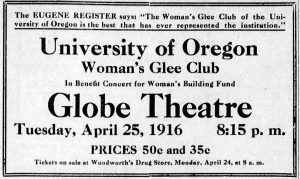 Globe Theatre, advertisement, Albany Daily Democrat, April, 20, 1916: 3.